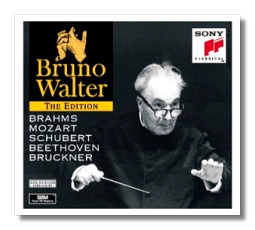 Sony has released the latest installment in the Bruno Walter Edition (#3), a ten-CD issue (all available separately). It includes the Brahms Symphonies as recorded in stereo with the Columbia Symphony Orchestra (actually the Los Angeles Philharmonic Orchestra with some free lance players around LA) coupled: #1 with ; #2 and #3 ; and #4 with the "Tragic Overture" and Schicksalied . Also from that source is Schubert's Symphony #9 (the Great) coupled with excerpts from Rosamunde. There is also an interesting coupling of the Brahms Double Concerto [with Zino Francescatti and Pierre Fournier] with the Beethoven "Triple" in a "stereo" recording with the New York Philharmonic and Walter Hendl (p) John Corigliano (v) and Leonard Rose (vc) . There is a lot of monaural Mozart: the Requiem (coupled with Bruckner's Te Deum) a monaural recording from 1956 ; and, also in mono, several of the symphonies: #25, 28,29 and 35 on 64473; #39-41 on 64477; and on 64474 is a two-disc set including Walter's rehearsal of the Linz coupled with the performance and the Prague Symphony on the second disc. SBM stands for Super Bit Mapping. This is Sony's latest version of working 20-bit technology into a 16-bit medium. In case you don't know what bits are, digital recording is based on a 1 and 0 numerical system of encoding information. Recall the story of the wise man who asked the king to pay him by placing one penny on the first square of a checker board and then doubling it each square. You go 1/2/4/8/16/ad infinitum. The same principal applies here. A 16-bit medium can contain 16 squared bits of information. If you add just 4 more bits you are significantly increasing the amount of information. The problem comes up in that the CD, as currently and popularly available, contains a maximum of 16 bits. How do you squeeze the extra 4 bits into the limitations? Well, John Kelly, who works for Sony, sent me a brochure that discusses the process. It is quite detailed with lots of squiggly graphs of sound waves. I've read, re-read and stared at the graphs hoping they'd suddenly reveal themselves like a magic eye picture. Oh, well. What I will say is that the process is very interventionist. It is not, however, so in a counterproductive way. What happens is that the engineers take the sound wave and bend it into itself. Much like time and space are bent at the ends of the universe (infinity in motion) this is done to the sound of a piece of music. After so bending it, adjustments are made based on the psychoacoustic responses of a panel of experts (musicians listen to the tapes and make suggestions which are then incorporated into the remaster). What are the results like? The Brahms Second Symphony is the first Brahms Symphony I learned to love. [You may want to skip this parenthetical, personal commentary at this point.] I had heard numbers One and Four (and thought the Fourth was boring, it's sometimes embarrassing to look back at early opinions of music) but it was the Second that made me re-think Brahms. It was on London with Istvan Kerstez conducting the VPO. He recorded an almost complete cycle with that orchestra. Only number Three was not recorded by Maestro Kerstez. He drowned before making the recording but the VPO recorded it sans conductor in honor of the Maestro. Anyway, it is the Brahms Symphony #2 I chose to use as a beginning point for this article. I compared the Brahms recordings with the CDs already in my collection. Some years ago I purchased the entire cycle by Walter on a Sony import (all Japanese insert notes). As the American issues came, I sampled them for comparison and found the Japanese discs superior. So, frankly I was somewhat skeptical that there would be any significant difference. As for the interpretations, much has been said about Bruno Walter's Brahms by many writers, I do not recall anyone having unkind words to say about these recordings. To my ears I hear a Brahms who is not just a prodigy of Beethoven and whose Symphonies are not mere step-children of Beethoven's. Brahms à la Beethoven may have some validity, but I hear something different, something more. Bruno Walter got a perfect balance in all of the symphonies in excellent sound, made even better by the SBM process. To me, these are THE Brahms Symphonies. Regarding the other Mozart discs, I strongly recommend that you add these to your collection. The price is right, the sound superb, the interpretations "historic". One of the intriguing comments Maestro Walter makes during the rehearsal of the Linz symphony is that he wants "less bass". This is especially telling in light of my observations of the stereo recordings. While at it, the disc containing the rehearsal of the Linz is fascinating. Maestro Walter stops the orchestra frequently, admonishes them and then hums what he wants them to produce. At first I found this frustrating. I have heard several rehearsals with Stokowski who interrupted the orchestra only rarely and, to my recollection, did not sing what he wanted, but told them in terms like, "More bow!!" I would listen to the orchestra and when Maestro Walter would stop them I would wonder "Why? It sounds fine!" I can imagine the orchestra having the same thoughts. Then, after his "touchings" I could hear why he stopped matters. It might have been "fine" but it wasn't good enough. Another conductor I have watched rehearse had a similar approach, Sir John Barbirolli. Such attention to detail is what makes the whole so wonderful and it is an education to listen to. The word Walter uses most often in the rehearsal is "SEENG!" and the orchestra does. Then there is the Requiem, coupled with Bruckner's Te Deum. Once again the sound is excellent!! Details are there in perfect harmony with the chorus, soloists and orchestra. This is not "historically correct" Mozart, but it is "musically correct". The violins and chorus in the Lacrimosa bring tears to my eyes, so aching is the experience. The Schubert 9th, is the stereo recording from 1959. Many critics have placed this as among the top recordings of the piece. While I love this interpretation, I find it a bit boring in places. Then, just when I am about to decide it is boring, Walter does something beautiful that captivates me. So, it's a mixed bag. The Furtwängler recording of the 9th with the Berlin Philharmonic Orchestra in 1951 still sends chills up my spine. For recent recordings I turn to the NAXOS with Michael Halász conducting the Failoni Orchestra. Now, these recordings are not in any way alike, in fact the Halász is much more a symphony written by a young man rather than a valedictory one. Anyway, it is good to have the Walter to listen to in much improved sound. The whole issue of Volume 3 is welcome and I am anxious to hear what is yet to come from Sony. Please let us have the Dvořák Symphonies #8 (still my favorite) and 9th, perhaps the stereo Mozart (done right, but I could live with just these), the other Schubert Symphonies, the Bruckner. etc. Regarding the other Mozart discs, I strongly recommend that you add these to your collection. The price is right, the sound superb, the interpretations "historic". One of the intriguing comments Maestro Walter makes during the rehearsal of the Linz symphony is that he wants "less bass". This is especially telling in light of my observations of the stereo recordings.